With begin 2018 immersed in an important national and international expansion with new offices in both Spain & Italy. A solid, sustainable expansion with equal standards of quality regardless of the country where we operate is the fundamental basis of our growth. To achieve this, every year we work towards maintaining the AENOR quality service certificate ISO 9001-2008whichvalues the level of our services. Without a doubt, the best certificate that we can achieve is the satisfaction of our customers. With this in mind, each year the office with the highest customer service score is awarded with a Quality Diploma. We analyse the efficiency and attitude withcustomers during the collection and return of the vehicle also waiting time in the office and the overall satisfaction of the customer in the attention received. 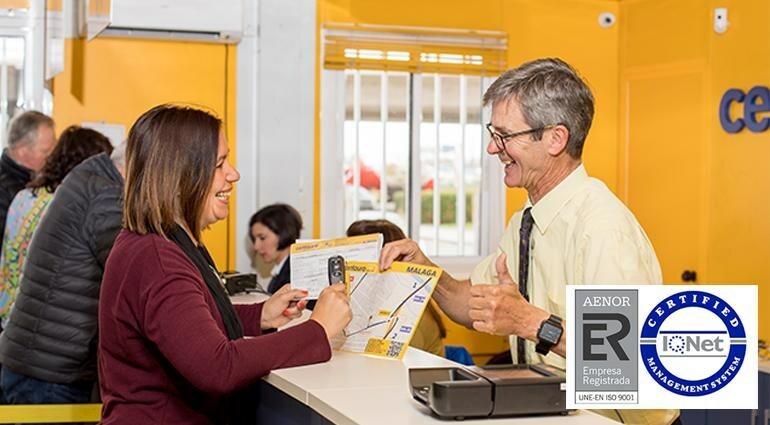 Centauro Rent a Car would like to congratulate all members of staff, especially our Torrevieja Branch for their professionalism and spirit to maintain the highest standards and to enable the company to continue growing year after year.